This year, we’ve decided to follow along with all of The Bachelorette action. Say what you will about the show, there are lessons to be learned from it (even if just what not to do), and we’ll be watching to see just what they are. During last week’s episode, JoJo finally bid farewell to Argentina and excused all the men who didn&apos;t have identical haircuts. At the final rose ceremony we were left with four men: Chase, Jordan, Robby, and Luke. Same swished-back hairstyle, same five o&apos;clock shadow, same pair of super-tight skinny jeans (different washes). Will time spent with their families set any of JoJo&apos;s lovelorn suitors apart? This week brought the much-anticipated hometown dates, during which JoJo travels with each of her beaus to meet his fam and get a taste of what life with the in-laws would be like. On the snow-capped mountains of Colorado with Chase’s family, I became convinced that Chase is the only man for JoJo...that is, when the only alternatives are Jordan, Robby, and Luke. Here&apos;s the thing, I know Chase struggles with expressive facial expressions (seriously, he could give Keanu Reeves a run for his money), but he just seems the most genuine of the bunch. Chase also handled the family situation very well. Wisely, he warned JoJo that they would be meeting his father separately because his parents&apos; divorce was very painful. Not only that, Chase asks his father why his marriage with Chase&apos;s mother failed, and he did this right in front of JoJo. Not your typical "Meet the Parents," but then again, your girlfriend isn&apos;t typically falling for three other men on television either. I respect Chase for his clarity about his parents&apos; divorce and about his own feelings on the matter. He has told JoJo he believes marriage is forever and that&apos;s not something he takes lightly. I don&apos;t know about you, but that&apos;s something a girl can really respect. Ugh, it pains me to say this, but as much as I like Chase, JoJo likes Jordan way more. JoJo ran into Jordan&apos;s arms in his hometown of Chico, California, and hung on tight as she toured his old high school stomping grounds. The difference between the way she treats him and the way she treats the other guys is obvious. Through her body language and physical cues, she treats Jordan like he is her boyfriend; she flirts and giggles and smiles. They seem like they have much more of an established familiarity. And yet, when it comes time to talk about feelings, Jordan looks veeery uncomfortable. Even JoJo, who is clearly partial, has her little shoulder angels on high alert. “How do I know you are still going to feel this way about me if it’s just the two of us after the show?” JoJo asks worriedly. I don&apos;t recall what Jordan mumbled, but whatever it was didn&apos;t instill a lot of confidence. 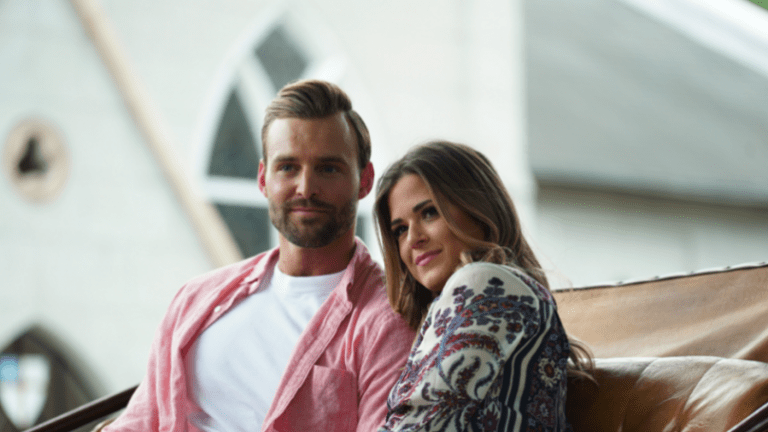 Ultimately it looks like JoJo&apos;s decision is Jordan versus the other guys, but I also hope JoJo looks past the tan and skinny-jean strut and asks herself one question: Is Jordan really the kind of man who is willing to do the hard work to make a marriage succeed? Honestly, I don&apos;t know the answer to that question—and it&apos;s not consoling the way he always bites his lower lip. If it&apos;s already a bit overwhelming to meet the families of all four of your boyfriends in one week (one can only imagine), then throwing in twenty of your guy&apos;s nearest and dearest is a good way to totally crash a girl&apos;s system. And that&apos;s basically what Luke did. Back in their native Texas, Luke picked JoJo up in his truck and surprised her with a giant barbecue, complete with toasts among all his nearest and dearest. It was enough to make one wonder…was this about her or him? If the numerous guests didn&apos;t keep JoJo on her toes enough all evening, Luke stole her away (just as she was getting some good dirt on Luke from his grandpa) to show her a giant heart he has made out of rose petals in a field. Just when I thought I had reached my cheese threshold, Luke spells out the metaphor. His heart is all hers. Too much, Luke, too much. Oy vey. As we arrive in quaint St. Augustine, Florida, Robbie&apos;s hometown, we are quickly reminded that the last committed relationship Robbie had was three months ago, to a woman named Hope whom he had dated for four years. What??? 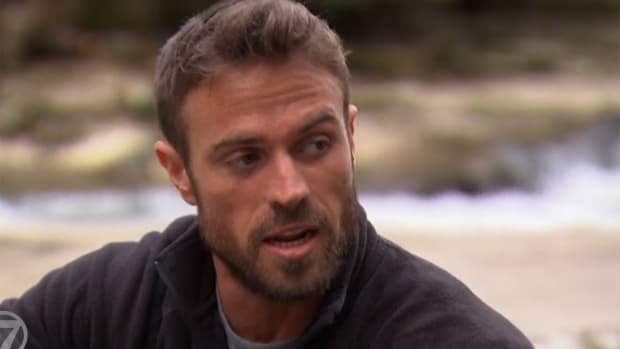 Robbie is definitely on rebound alert, but even more suspicious is the rumor that he ended the relationship to be on the show. JoJo understandably seems a little unnerved by the gossip. 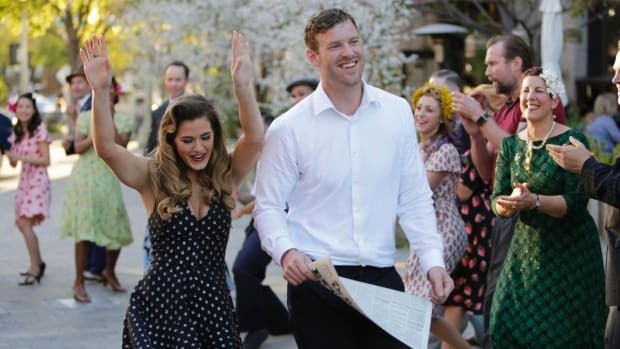 Robbie assures JoJo that the relationship was over nine months before they officially broke it off; they were having problems for a long time, and three months before filming The Bachelorette they broke up (Robbie added that she slapped him across the cheek). JoJo seemed placated by this response, but I as a viewer am certainly not satisfied. Rumors aside, honestly who heals and gets over a four-year relationship in just three months? Luke Doesn&apos;t Get a Red Rose—or Does He? JoJo came to the rose ceremony anxious, but with her mind pretty much made up. Luke, she tells the camera beforehand, would be going home. But just as she is about to give out the final rose, Luke asks for a word. He tells her that he should have been more clear, when he told her she had his heart, he meant “I love you.” To which JoJo replies, “Thats what I needed to hear, thank you.” I guess she likes to have her hearts “in love” before she breaks them. But wait, JoJo has an unexpected panic attack about the whole thing and we are left watching JoJo crouching on the ground, crying. Apparently, dating multiple people who say "I love you" can do a number on one&apos;s psyche. With no men sent home, the pressure&apos;s sure to continue as we head into a double episode next week. Maybe she is going to check into Robbie&apos;s story, or maybe she is going to ask one of the men to style his hair differently, just to see if it changes the way she feels about them. We&apos;ll all find out next Monday and Tuesday.